Standup Paddleboarding is one of the best sports ever. However, winter does not care how much you need some paddle time. And what fun is there in freezing on your board? With the chilly weather, it may seem impossible to go standup paddling—except SUP barely has any impossibility. SUP enthusiasts love it so much that there is almost nothing they wouldn’t do to enjoy the sport. If you are reading this, you must be one of those enthusiasts too. If you have not tried cold weather SUPing yet, you are in for a serene, divine experience. However, since it is winter, you need to prepare a little more for paddling and take necessary precautions. You cannot just grab your inflatable stand up paddle board and hit the water; it is winter, and you need to be warm, comfortable and safe. Take a hot beverage like tea, coffee or whatever works for you, as long as it is not alcoholic. It is also good to carry some because you will need it after the paddle. Believe it or not, you will find this more relaxing, and it will heighten your experience. No matter how much you trust yourself, double check and make sure that you have all the equipment that you need like drinking water, your leash, extra clothes, etc. Inform your friend, roommate or spouse that you are going paddling and what time they should expect you back. Leave your float plan (yes, you should have one) with them. Get a waterproof container (you can purchase one or use a plastic peanut butter container) to carry your phone and GPS. Those are important, and they need to stay dry. Note that in the winter, your charge does not last long because of the cold so make sure you get back before your cell phone shuts down. Check the weather report keenly. Be aware of the temperature, wind direction, and the general forecast before you go paddling—the last thing you want is a weather surprise out there in the cold. You will not enjoy being caught up in a rain/wind storm. You need to take your gear seriously. You want to enjoy yourself not get yourself sick. Suppose you fall in the water without the right gear? The thought itself is chilling, but falls are inevitable sometimes. You should dress for the cold weather as well as the cold water temperatures. Know how to wear the proper layers. Ensure that your feet, hands, and head remain warm if you want a great experience. (But who wants a bad experience? Well, no one). A neoprene or fleece toque is just perfect for the head. A fleece beanie will do too especially if you value comfort because it will not make you itchy. For your hands, get waterproof gloves; not ones that are too bulky, though, you only want to keep your hands warm and dry, not make them heavy. You have several options to choose from while dressing your feet for cold SUPing. Check out the three options below. A pair of neoprene boots will give your feet the warmth they need. A pair of surfing boots is also a great choice. Alternatively, you can get Vibram Fivefinger shoes which are recommended by most SUP pros. Your feet would not freeze in these even if they want to. On to dressing the rest of your body—this is where you might need more layers. Do you wear a drysuit or a wetsuit? There is no definite answer to this, meaning you can choose either one. However, a wetsuit is intended to be worn in the water. The water gets to you through the neoprene, your body heats it up, and it keeps you warm. If you are SUPing with a wetsuit above the water, it will not hold much heat, and you will feel the chill. Again, these wetsuits are a tad too tight and paddling might be uncomfortable. But if you still decide to go with a wetsuit, layer up. If you cannot afford these suits (they are a little bit on the high end), waterproof pants and a pair of longjohns (fleece) will do the trick for the bottom half. For the top half, wear a long-sleeve t-shirt, a sweatshirt and a jacket that is waterproof. Avoid cotton at all costs. It will soak in the water and you will end up very cold. It might be the last tip on the list, but it is not the least important. 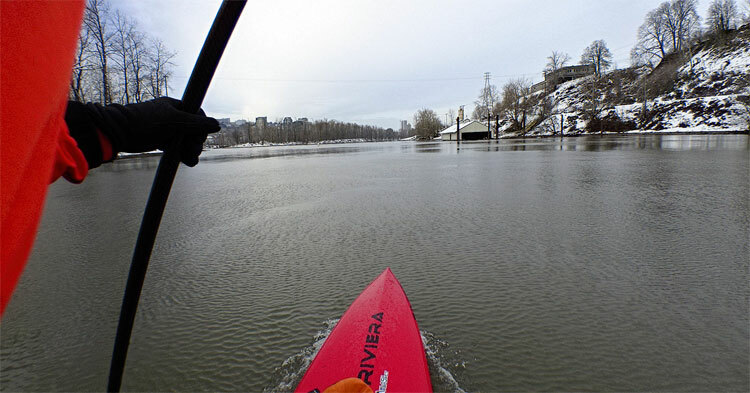 Not to scare you but winter paddling can be dangerous. Nonetheless, there is no cause for worry if you take the necessary safety measures. For one, never forget to wear your PFD. While maybe in the warm weather you prefer the waist pack PFD, in winter you need to wear your actual PFD. Sure, it is bulky; but on the brighter side, it is added warmth, and you can keep your power bar, camera and whatever else in the pockets. Secondly, wear your SUP board leash. Imagine being out in the freezing water having lost your board. It is scary. Attach the leash properly to yourself and ensure it is secure. Fasten your dry bag to your paddleboard. It is essential in case you want to carry some extra clothes. Besides, when you have worked up a sweat, you will need somewhere to store the layers. Remember, during winter, the days are quite short. Do not get lost in the serenity that you stay out later than you intended to. If you think you might be tempted to stay out after dark (or for extra measures, even dusk) carry a waterproof white light. Attach it to a visible spot (your body or your board) for other people to see you. Be wary of duck hunters. You should know where they are and avoid the area. Otherwise, they may not see you and dodging a bullet is not that easy. SUPing in winter may not be as safe as it is in summer but the experience is out of this world. You can only experience it, but you cannot describe it—especially if you are crazy about paddling. Do not let winter keep you from this beautiful activity. Just be extra careful. Take everything that you will need to stay safe, put on the correct gear and take care. One thing is for sure; you will love cold SUPing.